Crouch played a personal best 20 games in 2017, missing only one match with a fractured cheekbone from Round Five onwards. The competitive midfielder averaged a career-high 28 disposals, seven tackles, six clearances and four inside 50ms. He also rediscovered his run and burst from stoppage, averaging 354 metres gained and kicking eight goals. Crouch was one of Adelaide’s best-performed players across the finals series. He polled 11 votes to finish fourth in the Gary Ayres award for the League’s top finals performer as voted by the coaches. 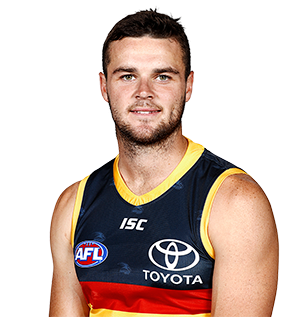 The former Rising Star runner-up ranked second at Adelaide for tackles (137), third for clearances (119) and contested possessions (253) and fourth for total disposals (561). Notched up his 50th AFL game against Hawthorn in Round 14. Finished the season strongly after an injury-interrupted start to the year. 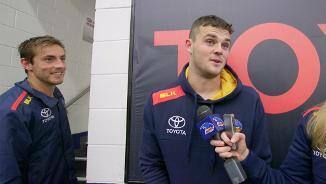 Crouch started the season in the AFL but was left out of Adelaide’s Round Three clash with Richmond due to a hamstring injury. Returned to confront the Western Bulldogs and Geelong the following month but was sent back to the SANFL to recapture his best form. The tough midfielder produced a string of dominant State League performances to force his way back into the senior side by Round 14 and didn’t look back, playing every game for the remainder of the season. Showed his grunt and class around the ball averaging 25 disposals through his last 12 games, including a season-high 34 possessions in Round 20 against Brisbane. 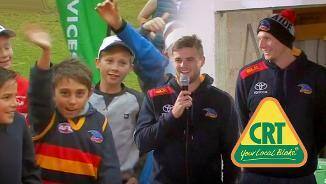 Signed a four-year contract extension that will keep him at West Lakes until at least the end of 2020. Crouch was unable to add to his AFL games tally in 2015 because of a persistent foot injury sustained in a NAB Challenge game in March. The skilful midfielder made two SANFL appearances in the middle of the year, but was eventually ruled out for the remainder of the season after experiencing more foot soreness. A key member of Adelaide’s engine room, Crouch will be hoping for an injury-free 2016 to help him deliver on the promise he showed as runner-up in the 2013 NAB Rising Star award. The 2013 Rising Star runner-up endured a frustrating 2014. Crouch recovered from a pre-season Achilles injury to line up in Round One, but was forced back onto the sidelines when he fractured his leg in the Showdown the next week. After a tough three months out of the game, the skilful young midfielder returned to help Adelaide to victory against Port Adelaide in Round 15. He showcased his enormous potential in the last nine games of the season, polling more Club Champion votes than any other Crow with the exception of runner-up Rory Sloane. Crouch lived up to the hype in his debut AFL season, finishing runner-up in the 2013 Rising Star. A hamstring injury cost the talented young midfielder a month on the sidelines early in the year, but he returned to play a total of 14 games, emerging as Adelaide’s best-performed midfielder in the second half of the season. In the last 10 games, Crouch ranked first at the Club in disposals (266) and handball receives (115), second in tackles (47), third in marks (50) and fourth in clearances (40), contested possessions (88) and hard ball-gets (30). His numbers also stacked up with the AFL’s best. From Round 14 onwards, the Ballarat product ranked 12th – level with Brownlow Medallist Gary Ablett – in the competition for total disposals, averaging 26.6 possessions per game. Won Adelaide's award for Emerging Talent. Ineligible for AFL selection in 2012, Crouch developed his game at SANFL club, West Adelaide. A hamstring injury caused him to miss almost two months of football early in the season, but he returned to be part of the Bloods' finals campaign. The talented midfielder got a taste of AFL against Brisbane during pre-season after the League granted him permission to play in the NAB Cup. 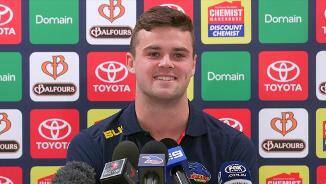 Adelaide moved swiftly to secure promising midfielder Crouch, who was eligible to join an AFL club as part of Greater Western Sydney’s 17-year-old ‘mini-draft’. Tough and skilful, the prolific onballer earned All Australian honours at the Under-18 Championships. The North Ballarat teenager, who turned 18 in January, won’t be available for AFL selection until 2013 and will spend his first season at West Lakes developing his game with SANFL club West Adelaide.